Professor at the Department of administrative and economic law. 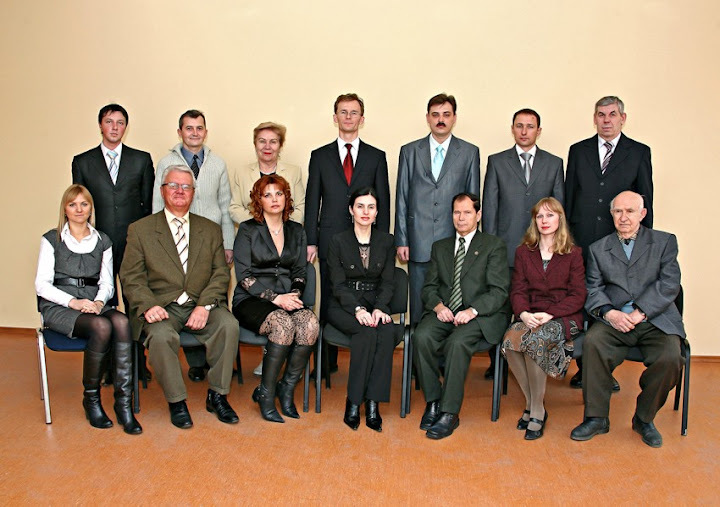 According to the Decision of Odessa National University Scientific Council by the Order of University's Principal dated12 November 1997, Department of administrative and business law was founded. The Department has been created on the basis of the Administrative Law and Management Department. Vasylyev Anatoliy Semenovych, Doctor of Law, Academician of Ukrainian Academy of Legal Science, Professor,was responsible for creation Department of administrative and business law and became its first Head. For further professional stafftraining in the following specialties: "Jurisprudence", "Management of the foreign economic activity", "Accounting and audit" and considering adoption of Commercial Code of Ukraine, the Department status was changed into Department of administrative and economic law with maintaining staff employees and personal labour agreements. (Ground: Decision of Odessa I.I.Mechnikov National University Scientific Council dated 6 July, 2004, report of the Dean of Economics and LawFacultyVasylyev A.S., Resolution of Provost Streltsov Ye.L.). The Department effectstraining of post-graduate top-qualification personnel in specialty "12.00.07- Administrative law and process; financial law; information law". At present the Department is working out research project "Public and private law regulation mechanisms of public relations in administrative-political, sociocultural and economic spheres" (state registration number 0112U002484) under scientific supervision of Mykolenko O.I., Doctor of Law, Associated professor. Total amount of personnel engaged: 17 persons, among them staff employees – 14 persons, part-time workers – 3 persons, Doctors of Science – 2 persons, Candidates of Science – 8 persons, lecturers having no scientific degree – 7 persons. Mykolenko Oleksandr Ivanovych - Doctor of Law (12.00.07 – Administrative law and process; financial law; information law), Associated professor. Bilyk Pavlo Petrovych - Cand. Sc. in Law (12.00.07 – Administrative law and process; financial law; information law), Associated professor. Nyznikova Viktoria Vitaliivna - Cand. Sc. in Law (12.00.07 – Administrative law and process; financial law; information law), Associated professor. Smytiukh Andriy Volodymyrovych - Cand. Sc. in Law (12.00.03 – Civil law and Civil process; family law; international private law), Associated professor. Stepanova Tetiana Valeriivna - Cand. Sc. in Law (12.00.04 – Economic law; economic procedure law), Associated professor. Chaikovska Valentyna Volodymyrivna - Cand. Sc. in Law (12.00.04 – Economic law; economic procedure law), Associated professor. Buga Sergiy Petrovych - Senior lecturer. Verner Natalia Mykolaivna - Senior lecturer. Ruban Mykola Mykolayovych - Senior lecturer. Yanovskyi Vadym Sergiyovych - Senior lecturer. Kistanova Yaroslava Mykolaivna - Teaching staff Member. Stoylovskyi Roman Viktorovych - Assistant lecturer. Lazareva Maryana Ivanivna - Teaching staff Member. Budiyanskyi Mykola Fedorovych - Cand. Sc. in Psychology, Professor. Stukalenko Olga Volodymyrivna - Cand. Sc. in Law (12.00.07 – Administrative law and process; financial law; information law), Associated professor. Bondar Vyacheslav Yakovych - Cand. Sc. in Law (12.00.03 – Civil law and Civil procedure; family law; international private law), Associated professor. Bilyk Olena Stepanivna - Senior lab assistant. Kosormygina Oksana Sergiivna - Senior lab assistant. Skliarenko Yevgenia Volodymyrivna - Lab assistant.